Anglo Indian wrestler : RAJENDRA SINGH sadly passed away on the 10th April 2012 from unknown causes. In recent years, he had settled in Preston and fondly referred to the Town as his home, but he actually originated from North London where his wrestling career began in the early sixties at the SPARTA amateur wrestling club in Falkirk Street, Hackney, training in the company of myself FRANK RIMER . 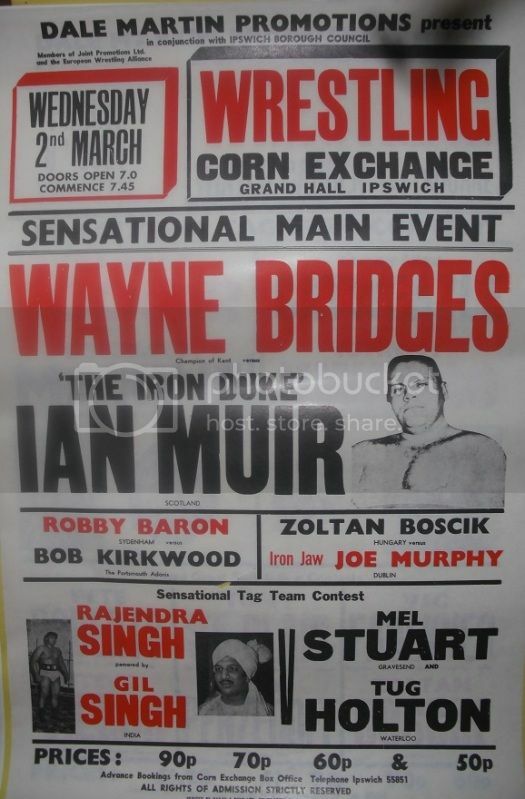 Raj as he liked to be known was my friend and colleague for many years as amateurs, having met when we both won the Southern Areas Championships, me as welterweight and Raj as middleweight. and he had visions of turning Professional at the same time that I did. We attended Dale-Martins training gym together in 1964 under the wing of the late great World shoot Champion : MIKE DEMITRE, who at that time was agent and Manager of RAY FURY another lifelong friend of both of us cadets. We even used to share our white boots if one forgot to bring his own, and we socialised a lot together in the evenings, frequenting the Bethnal Green pubs, to see who could attract the most girls. Raj would win with his swarthy good looks, black curly hair and trademark moustache. He came from a market trader background and never lost his down to earth London ways. His wrestling career took off quickly,as Indian wrestlers were in high demand on the circuit, following in the footsteps of other Asian legends like DARA SINGH, DALIBAR SINGH, TIGER SINGH and MAJID AKRA. Raj once told me that the name Singh is like Smith in this Country and denotes that the person is a Sikh. In later years, he developed many Business skills and used that to good effect in his adopted hometown of Preston. He leaves a widow and four children. A really talented wrestler that could work with any opponent, and extremely well known on the Independent circuits,he will be missed by all who had the privilige to know and wrestle him especially myself.